Posted March 18th, 2019 & filed under England Carrier Services. It doesn’t matter what size your fleet is, what equipment you run or which part of the country you’re in. One thing is true for all fleets: You will need to replace the tires on your trucks or trailers at some point. There are many tire brands from a variety of manufacturers available in the market. With so many options, what factors should you consider when purchasing your next set of tires? The first thing many people look at is the price of the tire. While this may sound like a simple calculation, it is a little more complicated than that. An inexpensive tire may seem like a good deal when you’re paying for it at the shop. However, there may be other factors that could end up costing you more money down the road. When you invest in a higher priced tire, you are buying from companies that invest in your fleet through state-of-the-art production facilities, better raw materials or research and development. This means you will save money over the life of the tire through higher mileage, fuel efficiency and keeping your truck on the road. When comparing tires, calculate an overall cost for the life of the tire including fuel savings. Over time, inexpensive tires will statistically lead to more breakdowns or trouble over the road. When delivering a shipment, the last place you want to be is stuck on the side of the road. Facing potential issues while you’re on the road could result in more downtime waiting for road service or at shops. An average tire service call runs close to $1,000 and rarely takes less than three hours. When taking these costs into consideration, an inexpensive tire can quickly become very expensive to your overall bottom line. While there’s never a guarantee that you won’t face tire troubles, you can decrease your chances by choosing a reliable tire. It’s also important to consider the application of the tire. Is it over-the-road, regional or off-highway use? Companies such as Bridgestone, Continental or Yokohama do extensive research on rubber compound, sidewalls and tread design in order to produce the correct tire for the application. These companies also have more choices to fit your specific needs. To keep your tires going the distance, choose a tire brand that is proven to handle the terrain. 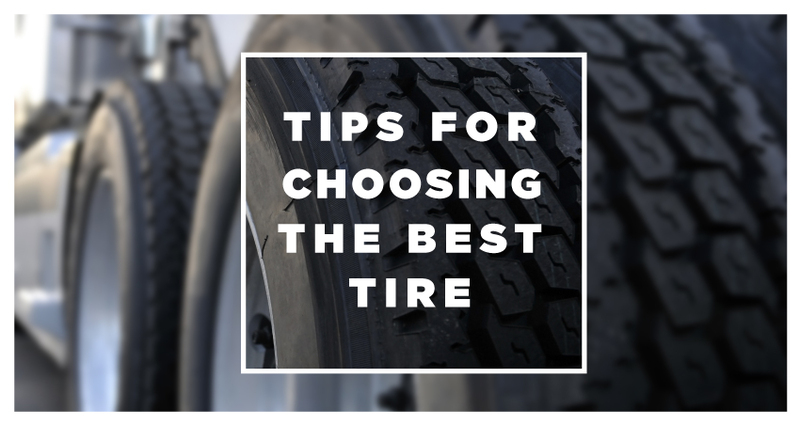 Choosing the best tire will save you time and money on the long road. Make sure you do your research and read reviews on the tire you’re going to purchase. Some carrier services companies have done the research for you and may be able to suggest a tried and true tire. Choose a tire from a company that has done the work to make sure you’re getting the best product available that will keep your fleet safe and profitable.